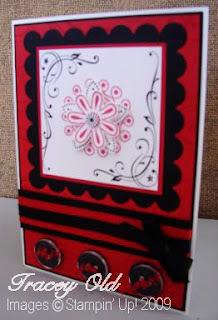 Tracey made this card, using a colour I'm loving at the moment - Red. Tracey also used an Inkspiration Sketch Challenge. 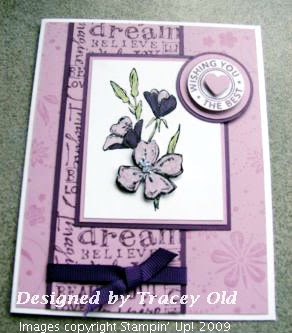 Visit Tracey's blog A Stampers Touch. Good afternoon everyone. I've been playing on my computer making a new watermark for my photos on Photoshop. 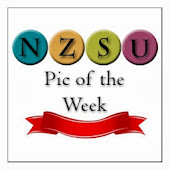 According to SU every picture of every card/layout/project that uses their products must have their name and copyright on it. Here's mine, the pink is just the background so you can see the lettering. Once you've got the image, open both the image and the photo you want to add the watermark to. Right click the watermark layer in the layers panel and choose 'duplicate' then choose the image you wish to duplicate it onto. Any questions just let me know. I had to have a go at this card, it's such a cute fold and I'll definitely be using it again! To see it open visit my blog Made By Me. Adele's only just been linked on the blog roll and already she's got her first challenge card ready. I love how she's versamarked the background. Show Adele your support by visiting her blog Del's Designs. What's your favourite techniques to use when stamping? 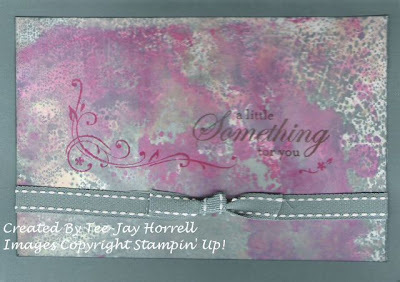 My favourite technique is paper tolling, I like to look at the stamped image and see if I can try and add some dimension to the card. How long have you been a demo and what advice do you have for new demos? I have been a demo now for 11 months and my best advice is do not sign up when you are already addicted to stamping, my business doesn't make any money because I spend it all on SU products (LOL). Same here. When you're not busy stamping and being a mum what else do you do in your spare time? Gardening, I love my roses and I am currently nagging my husband to finish my vegetable garden. What are you hoping will be in the new catalogue? Lots of gorgeous new ribbons and flower build a brads. You can visit Amy's blog by clicking HERE. 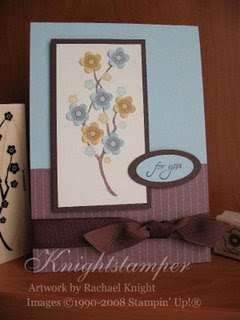 Now this card would be perfect for a workshop, not too complicated, but still a sweet card. 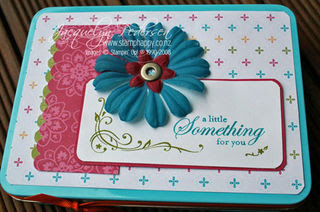 Visit Jenny's blog Stampin by the Seat of my Pants. I was supposed to post these a couple of days ago, but time just got away from me and the weather has been too lovely to sit in front of the computer. Sorry. So here's Katrina's entrys. She's been busy and made not just one but two cards. And both of them are great. 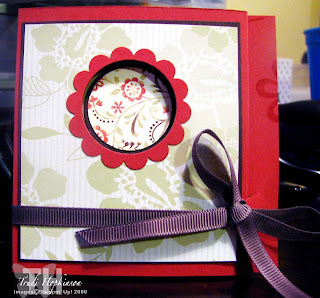 Check out Katrina's blog KatScraps. 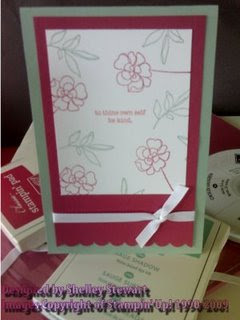 Judy Reader made this adorable card using Botanical Blooms. 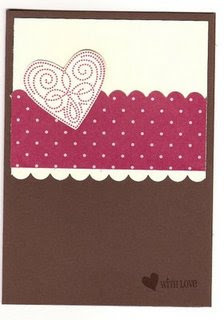 It's another sweet card that I'm sure the receiver will love. 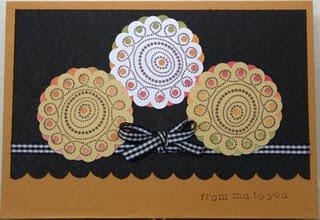 Here's a very simple, but very cute card by Sharon Dines. You can visit her blog by clicking HERE. 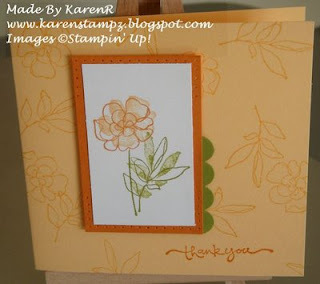 Karen has made this sweet little card using the Botanical Blooms SAB set. Have a look at the rest of Karen's Blog HERE. 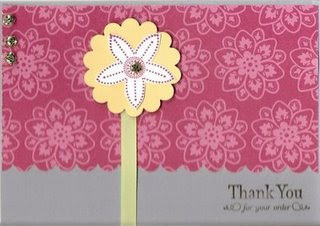 Shelley used the very pretty set Botanical Blooms for this card. Love the colour combination she's used. 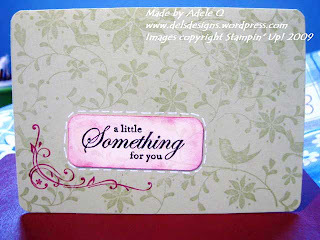 See what else Shelley's been creating on her blog Stampin-Shellz. Keryn made this cute gift and the SAB set is perfect for it. It's filled with delicious chocolate (something I've gone without for a whole week!) 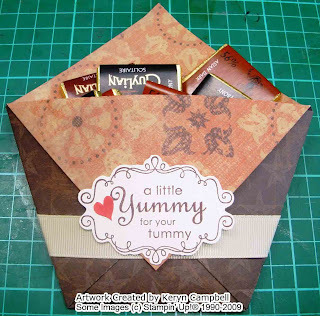 Check out Keryn's blog with her latest tutorial. 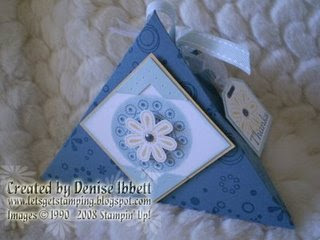 This is Denise's first time entering a challenge and she's made the cutest little gift box. Denise is new to blogging so I'm sure she'd love it if you visited her blog and left a comment. To visit Denise's blog click HERE. 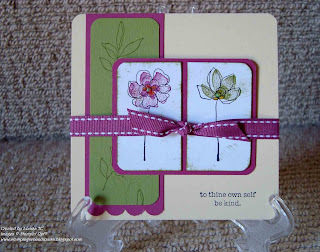 Louisa made this cute little card using a SAB set. To see more of Louisa's work visit her blog HERE. I'm really enjoying using this sketch, I had this card going around in my head last night. For the recipe see my blog Made By Me. Tracey's been busy making cards using different sketches. Here's her version of Makeesha's. 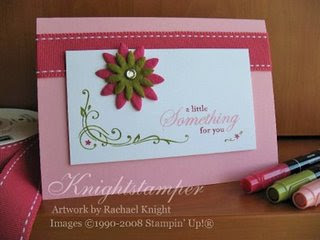 Visit Tracey's blog A Stampers Touch. I love the colours Kim's used and she's done some beautiful water colouring. This isn't an official entry into the January Challenge but since it uses a SAB set and it's a great idea I thought it deserved to be posted. Jacqui altered a hodgepodge tin and it's come out fantastic! To get a glimpse of what she's filled it with visit her blog Stamp Happy. Jacqui's also got a great video tutorial on colouring the flowers from the pretties kit. The entries are starting to come in for the January challenge, unfortunately I haven't recieved any SAB yet, but hopefully will post something soon. Here's Tee-Jay's entry, I just love how she's done the background. Thank Goodness for Tracy Jackson!!!!! Not only is she my fab upline but she is also the only one that has done my challenge, and she used Trudi's sketch too. So you can all admire her card in all it's loveliness until you do you own and get them put on here. Hmmmmm maybe if I changed my name to Kristina Werner I would get more people participating. We all need a little help to get started sometimes and one of the best things I've found is sketch challenges (after blog hopping of course). Makeesha an Aussie demo is running a sketch challenge at the moment, so I thought I'd share it with you as well. If you've received your Jan issue of Impressions you'll have read he back page article on Rachael. She achieved the number 5 spot for demo of the year. Congratulations Rachael! With cards like this, no wonder she's done so well, they're stunning! Check out Rachael's blog Impressions of a Late Knight Inker. We are officially one year old as of 26th December 08! I can't believe we started off with about 6 blogs and now we're up to 40. Thank you to everyone who has shared their creations, ideas, thoughts and a little bit of their lives with us over the past year. And thank you to everyone who has participated in challenges. I've met many wonderful ladies via emails and comments. I'm looking forward to a new year filled with more cards and projects and am hoping to finally catch up with my scrapbooking - especially as that is what I originally started out doing. And also seeing what everyone else puts their talents to. Thank you for sharing with us and I hope that your year is filled with happiness and blessings and the only challenges you face are colour ones.